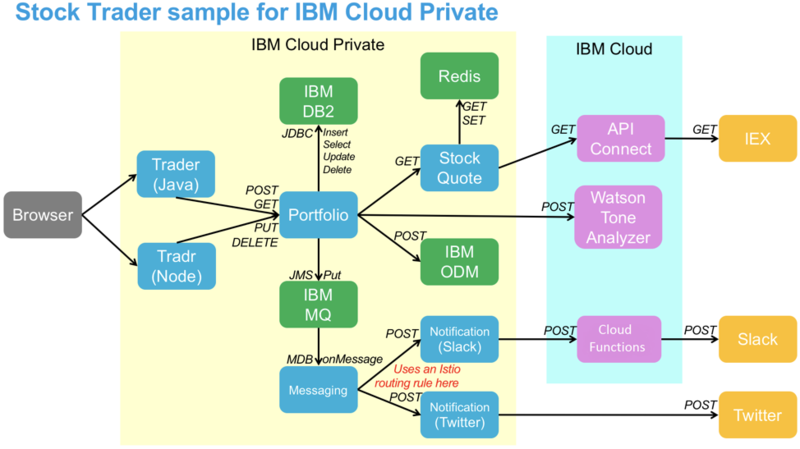 The IBM Stock Trader microservices are available as a set of projects in GitHub. The instructions walk you through setting up the middleware dependencies (IBM Db2 Developer-C, IBM MQ Advanced for Developers, IBM Operational Decision Manager, and Redis) in IBM Cloud Private. They also walk you through setting up API Connect, Tone Analyzer, and Cloud Functions in the IBM Cloud. The most interesting aspect of this work was developing the scripts. They were designed to work with no input from the user. They use kubectl commands to find key Kubernetes resources, such as services that were created by the middleware Helm charts. They use this information to create Kubernetes secrets for IBM Stock Trader to access the middleware service and to create middleware artifacts, such as database tables and messaging queues. The approach I took focuses on the fundamentals. In other words, the user must deploy the application step-by-step and build it from the ground up. This could be used to build a higher-level turnkey solution that would deploy everything at once, using tools such as Helm, Ansible, or UrbanCode Deploy. I originally tried to develop the all-in-one solution first, but found it was too difficult to start there. I needed to develop the groundwork first. Now that it’s there, future efforts to automate the complete deployment should be easier. I encourage you to try running the IBM Stock Trader application yourself to see how to construct a hybrid cloud application using microservices, collocated middleware, and cloud-hosted services.